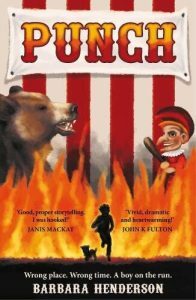 Punch by Barbara Henderson is the story of Phineas, or Phin for short, who lives and works in Victorian Inverness with his “Uncle” Ewan, a cruel man with “hands the size of spades” who treats Phin like a slave. When Phin is sent to the market after hours to fetch some sausages from the ice box, an incident with a dog and a watchman leads to disaster, and he’s accused of setting the market on fire – so he runs. Runs from the fire, runs from the accusations, runs from Uncle Ewan. He falls in first with an escaped prisoner, John Robertson, and then with Merriweather Moffat, his wife Alice, and daughter Ishie, a travelling band of entertainers, whose Punch and Judy show is a hit with audiences across the country. Slowly Phin finds a new family with John and the Moffats, meeting new people, making friends with animals, and learning new skills. But the hidden misery of his history isn’t far from the surface, and he can never truly leave it behind. Eventually a figure from his previous existence comes back into his life, and gives him an opportunity to stop running and face his past once and for all. The setting is vivid, the story dramatic, and Phin’s relationships and decency are heartwarming, especially Phin’s sympathy for the mining children for whom the travellers put on a show: “My world is a rainbow. His is a shadow.” Victorian Scotland comes brilliantly to life, from the depiction of 19th century Inverness to Phin’s travels across the country, from snow-bound Edinburgh to an encounter with royalty at Balmoral. An excellent follow-up to Henderson’s brilliant debut Fir for Luck. Highly recommended.